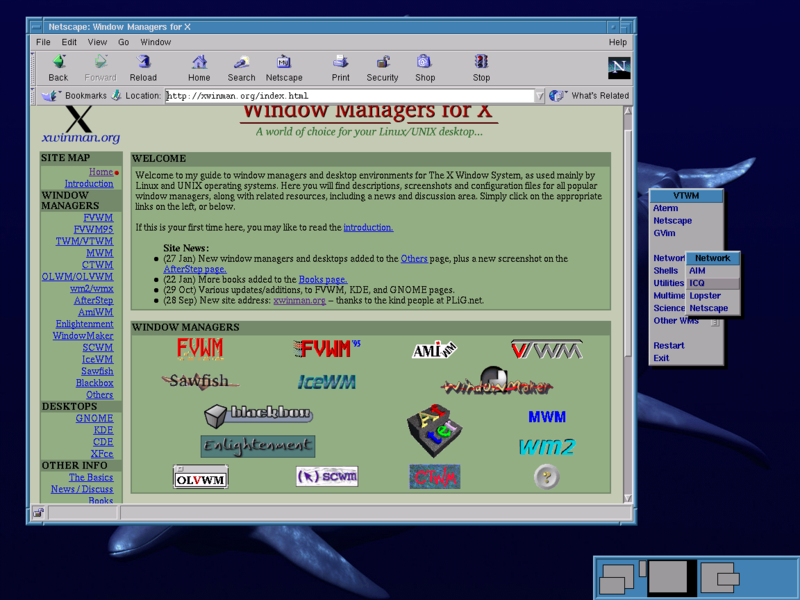 Twm (Tab Window Manager, or sometimes Tom's Window Manager, after the principal author Tom LaStrange) provides titlebars, shaped windows, several forms of icon management, user-defined macro functions, click-to-type and pointer-driven keyboard focus, and user-specified key and pointer button bindings. It has however been left behind by more recent window managers, making it something of mainly historical interest. It was for some time the only real choice of window manager, after taking over from the very simplistic uwm. Nearly every window manager since has borrowed heavily from it, either directly, or indirectly through other window managers, such as fvwm. From matt@belgarath.org, added in June 1996: screenshot (14k), twmrc. From brummelufs@hotmail.com, added in March 1998: screenshot (42k), twmrc. From cjmckenzie@ucdavis.edu, added in February 2001: screenshot (21k), twmrc. From keppler@satimex.tvnet.hu, added in August 2001: screenshot (31k), twmrc. The source code is no longer developed, but old TWM archives for various releases of X are available. A paper about twm is also available in PDF format. Vtwm is a virtual window manager with the look-and-feel of twm. From cudcv@csv.warwick.ac.uk, added in June 1996: vtwmrc, screenshot (16k). From stuce@csv.warwick.ac.uk, added in June 1996: vtwmrc, screenshot (233k). This setup is used with this xsession file. 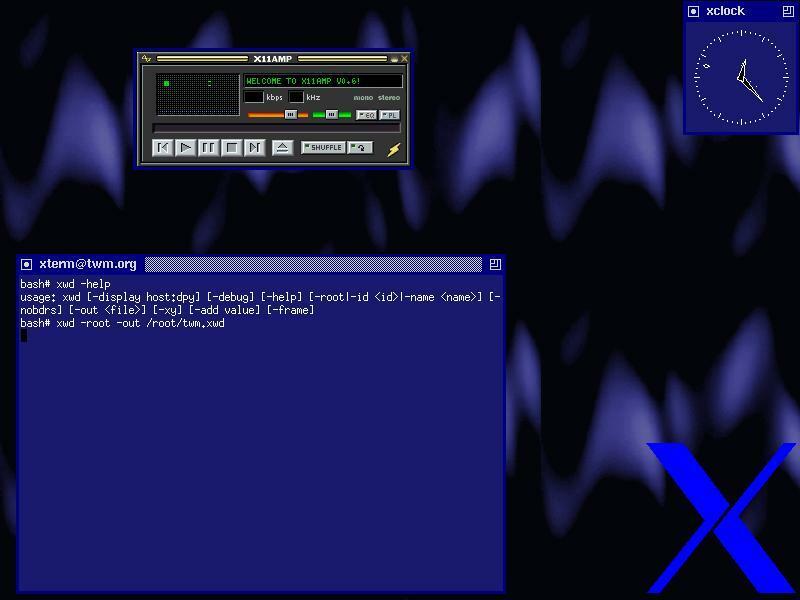 From matt@belgarath.org, added in June 1996: vtwmrc, screenshot (16k). From viper@hh-threshold.csh.uiuc.edu, added in October 1999: vtwmrc, screenshot (215k). This setup also makes use of an ~/.Xclients file. 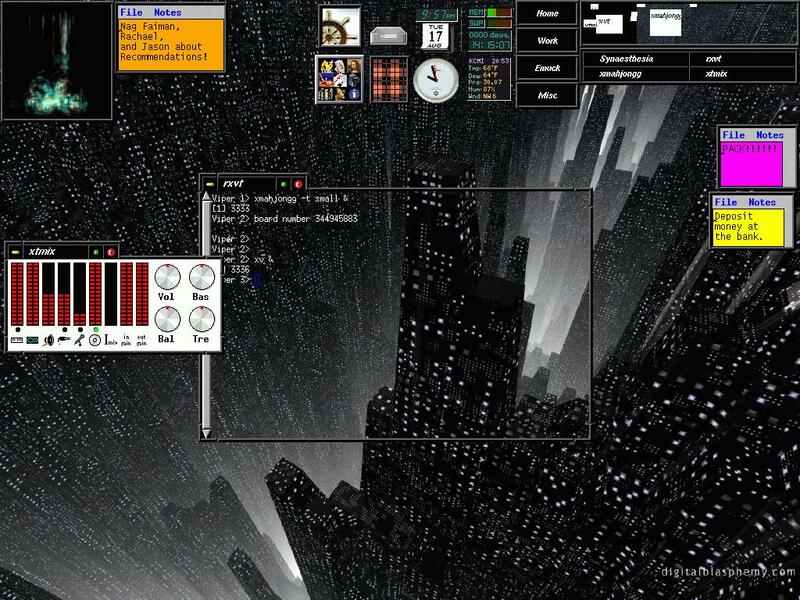 From richard_k@gmx.net, added in April 2001: vtwmrc, screenshot (129k). From hawkeyd@visi.com, added in October 1997: This vtwmrc and screenshot (100k) is from the first release of the vtwm-5.4.x series. From pronic@gmail.com, added in January 2005: This vtwmrc and screenshot (124k) is from vtwm-5.4.6b.